Server rooms and data centers require precise control of the environment. Correct temperature is critical to maximizing the performance of the equipment and minimizing the risk of failure and lost data. Server rooms and data centers generate heat 24 hours a day, 7 days a week. This goes on even when the outdoor temperature is below freezing. Typical room air conditioners are not suitable for continuous operation or low outdoor temperatures and should not be used for server rooms. Mitsubishi makes a ductless spilt system air conditioner that is ideally suited for server rooms. Their "P" series Ductless Air Conditioners utilizes an innovative Inverter-driven technology. It responds to both indoor and outdoor temperature changes. The Inverter automatically adjust as the load changes and can operate efficiently with outdoor temperate below zero. 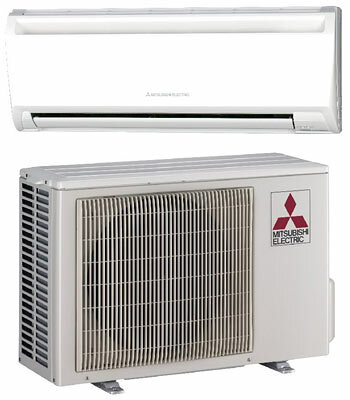 Avaible in various sizes and configurations, Mitsubishi Ductless Air Conditioning can be installed in almost any application. Cooling-only air conditioners with INVERTER-driven compressors for improved energy efficiency.